A few months ago, before the birth of my son, I had this cute organic listed in my Etsy shop but it didn't sell. 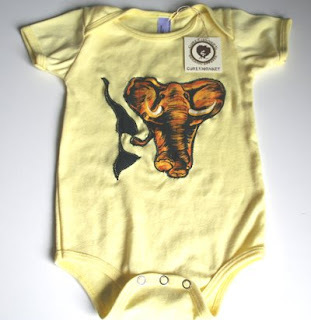 It was a yellow organic onesie from american apparel, size 6-12 mos with a fabulous elephant appliqué on it. 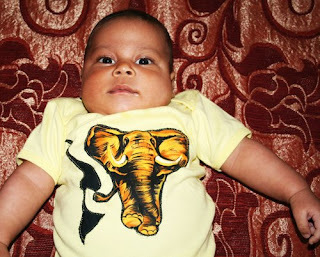 I love this Elephant (cut out of one of my husband's shirt (yes, he knows about it!)) and since my son is now big enough to fit in it...it is his now. Yes He DOES Look Happy! He is so Handsome! 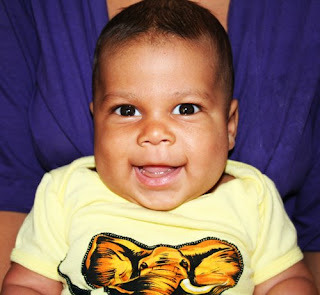 Lucky him to get the onesie- it looks fantastic on him!